Welcome to my pages about 'Gentoo', a 7¼ inch gauge Stafford Class Saddle Tank steam locomotive manufactured by Station Road Steam. In these pages I hope to share with you my experiences of operating and maintaining this locomotive. Having seen the locomotive at many model engineering exhibitions throughout its development by Station Road Steam I eventually decided to make the change from owning a 1/3rd scale Tasker traction engine to a railway locomotive at the end of 2009. Consequently I ended up by purchasing one of the first batch of three locos produced for delivery in the late spring of 2010, but by the time I had built the driving trolley and added a few items to the engine I did not have my first run until September 2010. The engine completed more than three seasons of regular passenger train work on my local model engineering society railway at the Pinewood (Wokingham) Leisure Centre before I sold it back to Station Road Steam and purchased the first of their 0-6-0 versions of the Feldbahn. During those years the Stafford covered over 524 miles of running, visited many other miniature railways, and proved to be a reliable performer. During public running at Pinewood it was frequently worked hard, on one occasion for a solid seven hours of passenger hauling, and it proved itself equal to the task being easy to fire and drive. My personal record for a nonstop run with this engine was just over 7 miles in 90 minutes and I had no problems with firing the loco during the run, I only had to stop because the saddle tank had run out of water ! On members days at Pinewood it frequently spent the day in the hands of the junior members and other novice drivers, and none of them managed to break it which says a lot for its design and ease of use. Finally, despite the huge number of hours I spent cleaning the engine I spent very little time on maintenance which showed that the reliability was very good. The very few maintenance actions / repairs that were required are detailed in the relevant positions in the Running Log pages. The Stafford Class Saddle Tank is not a replica of any particular full size locomotive but it bears more than a passing resemblance to some of the Bagnall narrow gauge engines. 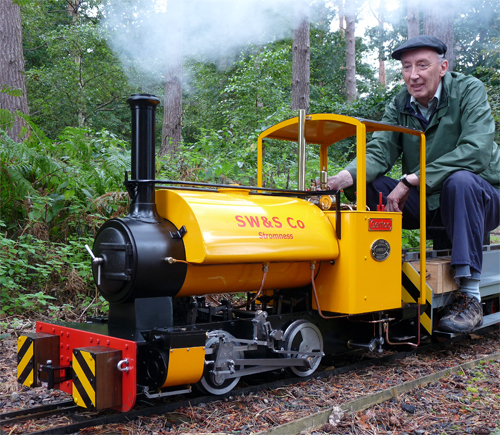 With many of the Bagnall engines operating on industrial sites or in quarries on 2 foot gauge track this model running on 7¼ inch gauge track is approximately 1/3rd full size and weighs 230 Kilos (almost a quarter of a Ton) when ready to run. Since the sale of that first batch of three locos Station Road Steam have produced and sold more than 75 Staffords / Feldbahns, the latter being modelled on the Orenstein and Koppel locomotives. They have also built variants for 5" and 7 1/2" gauges as well as a much larger version of the Stafford to run on 10 1/4" gauge (or 7 1/4" gauge for those requiring a very large engine). As with all engineering projects each batch includes improvements made as a result of "lessons learnt", so if you buy one today you may notice many detail changes with respect to my 'Gentoo'. The question people most often ask me is "are you happy with the loco ?" The answer is unequivocally YES, so much so that I purchased one of their Feldbahn variants ! Having been involved with engineering all my professional life I would say that it represents very good value for money and it is doing everything that I wanted it to do. Although I consider myself to be a competent model engineer I don't have the workshop equipment to build an engine of this size myself. However, like many model engineers, I enjoy tinkering with things and the Stafford is an ideal engine for me. If you look at the photo on this page you will see some of the modifications I have made to my Stafford simply because I could, and they are all explained in the modifications pages of this website. It will be very hard to improve the performance of the engine, but that won't stop me (and probably many other owners) from adapting it to suit their individual needs or preferences. I hope that you enjoy this website and that you may find some of the information on these pages useful to you. As far as possible I have endeavoured to provide links to all the references and other relevant websites mentioned in these pages, so if you wish to know more about a topic or organisation then please use the Links tab on the navigation bar. If you would like to read about my other model and engineering projects then please click here. NOTE: The content of this website represents the views of the author, which may not be supported by Station Road Steam who manufacture and sell the Stafford Class locomotive.